There are a lot of legal requirements for a whiskey to be a considered a bourbon. It has to be distilled in the US with a mash bill of at least 51% corn and aged in charred new barrels—all wonderful things. While there’s no restriction on the size of the barrels, most distilleries use 53 gallon barrels. But why is that? Is it an old tradition that dates back to shipping practices of the 1700s? As it turns out… No. Up until World War II, the standard barrel size was 48 gallons. 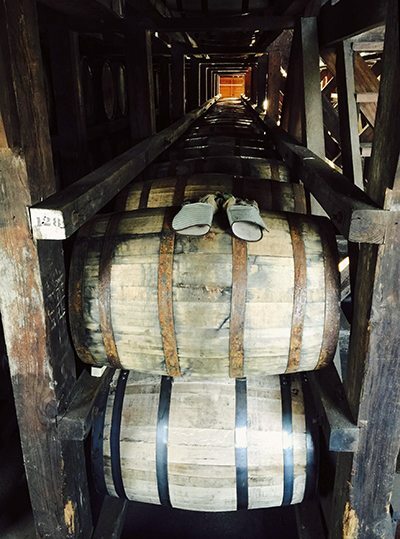 Barrels of this size were easier to manage and roll through the rickhouse, and the racks were built to accommodate their size. But as the Second World War continued on without an end in sight, resources became more precious. Resources like lumber. Cooperages and distilleries had to figure out a way to continue to age their whiskeys while cutting back on the amount of wood they used. What they came up with was pretty ingenious. By increasing the barrel size to 53 gallons, they could store more whiskey per barrel, but the new containers would still fit on the original racks without having to massively upgrade the rickhouses (which would have required massive amounts of lumber). If they went bigger than 53 gallons, they also worried about the structural integrity of the barrels, with the increase in size potentially causing more leaks. While 53 gallon barrels were a little harder to handle and roll, it didn’t represent an insurmountable challenge. Clearly, after three generations, distilleries never went back to 48 gallon barrels. In addition to providing the men and women serving overseas with a ration of liquid courage, the bourbon industry contributed to the war effort in a few other surprising ways. A few distilleries that had been shut down during prohibition were repurposed to create penicillin and fuel. If you can’t make whiskey during a time of war, penicillin and fuel are pretty good substitutes.